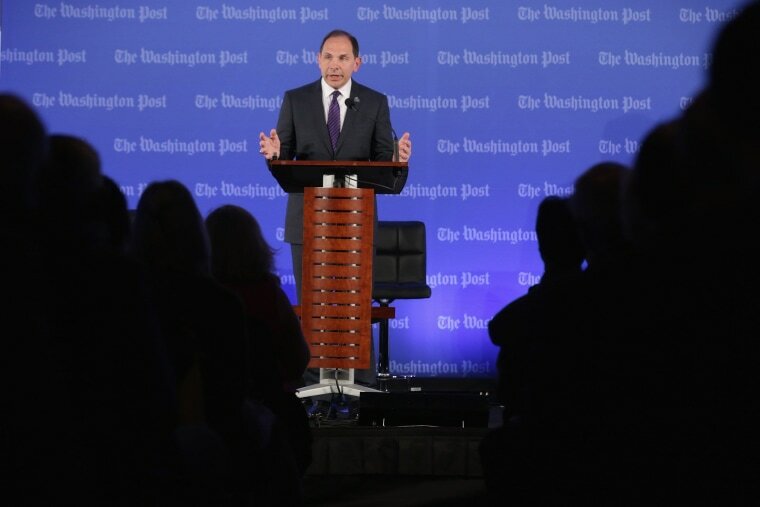 Veterans Affairs Secretary Robert McDonald's appearance on 'Meet the Press' last week has gotten a fair amount of attention because of something he told Chuck Todd. Namely, that 60 people have been fired from the department for their role in the wait times scandal that caused former General Eric Shinseki to resign from that post last year. That statement, that 60 people were fired due to the patient scheduling scandal is incorrect. An official at the Department of Veterans Affairs told NBC News that Secretary McDonald "misspoke." According to paperwork provided by the House Veterans' Affairs Committee, the V.A. has proposed disciplinary action for 75 people, but only eight of those people were fired. If you also count those who retired or resigned in the face of removal and those who were removed during a probationary period, that number goes up to 16. Far short of 60. No one is really questioning whether 900 people, total, have been fired since McDonald became the V.A. Secretary, but that number could also be considered misleading when used as a way to show increased accountability in the department. As Politifact pointed out, "To get to 900, McDonald is also counting 487 'probationary terminations.'" Those are people who are removed before their tryout period in the federal government is up. So what is the level of accountability at the Department of Veterans Affairs if people who have only been there for a short period of time make up about half of the terminations?